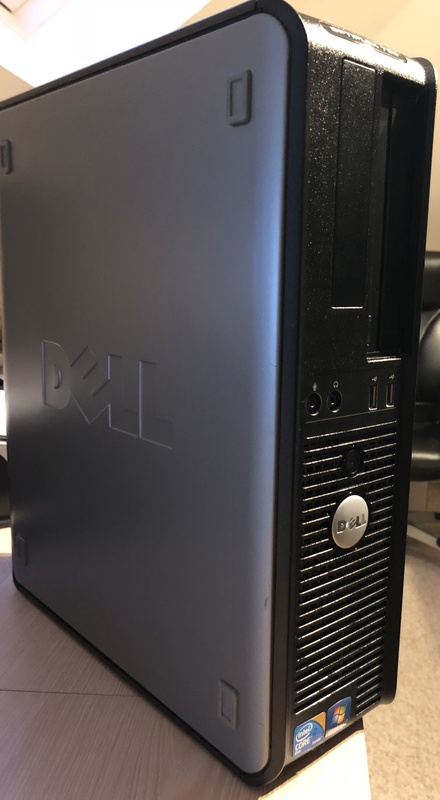 I recently acquired this Dell Optiplex 780 during a website development project. Its intended use was as a testing server to develop a site and allow it to be remotely previewed before going live. I knew the machine had reliability issues having originally taken it out of service myself, but it did do Stirling work for a week or so before giving up entirely. These machines are designed for the corporate market and are designed to be rugged, reliable and dependable – which this one isn’t. Nevertheless, it isn’t a bad factory spec and I decided it was at least worth a minimal time investment to get it going. Opening the side is achieved by pulling a lever on the top. Dell have used several case designs in the past including one particularly irritating design whereby the side and front of the case would hinge open, once a pair of clips on the top and bottom were released. This design (seen in the Dimension 8300 amongst others) is a perfect example of unnecessary over-engineering in a PC case. 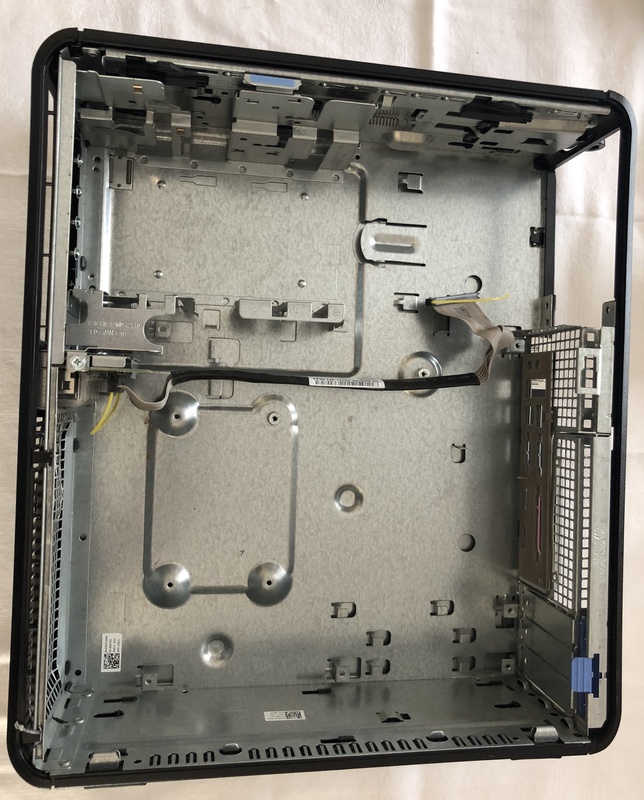 Thankfully Dell later opted for a more traditional case design with a sliding panel released by a latch (à la dimension 4600I) which was a far better idea, though not entirely toollesss as a flat-bladed screwdriver often needed to be employed to release the stubborn panel. Here we have a latching mechanism which not only releases the door but simultaneously pushes it away from the case. It’s logical given that this is a small form factor PC and thus the side is also the top in its ‘flat’ orientation. Other aspects of this case are toolless too including the optical and hard drive bays and to an extent the power supply though the latter is also secured by two screws at the back. 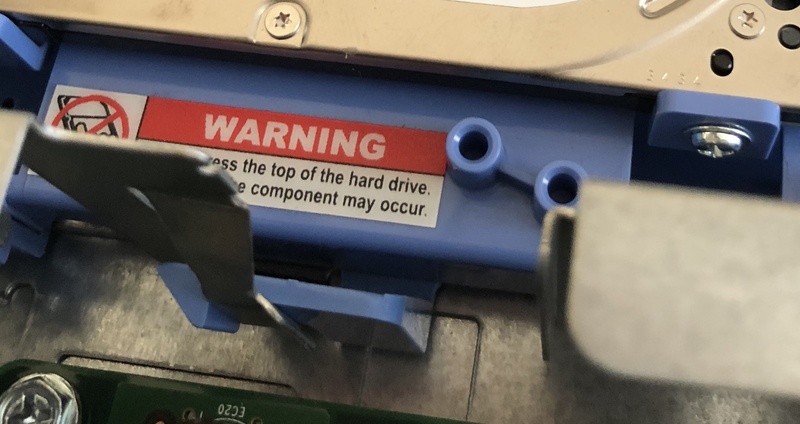 The optical drive is held by a pair of protruding screws which act as hooks; a reasonable idea when the case is flat, but a poor design that allows the drive to shift when the case is in its upright orientation. The hard drive bay is another matter entirely. Removing that bay took me an embarrassing 30 minutes when I first received this machine. Two hidden tabs must be squeezed, at which point the bay can slide forward and be lifted from the case. It’s the perfect example of a design that is far more complex and irritatingly unintuitive than it needs to be. Mounting the optical and hard drives in a metal bracket, which then screwed into the case as a single unit would have been a far better approach. The drive bay can take a pair of 2.5” drives, though the power supply provides no second power outlet. 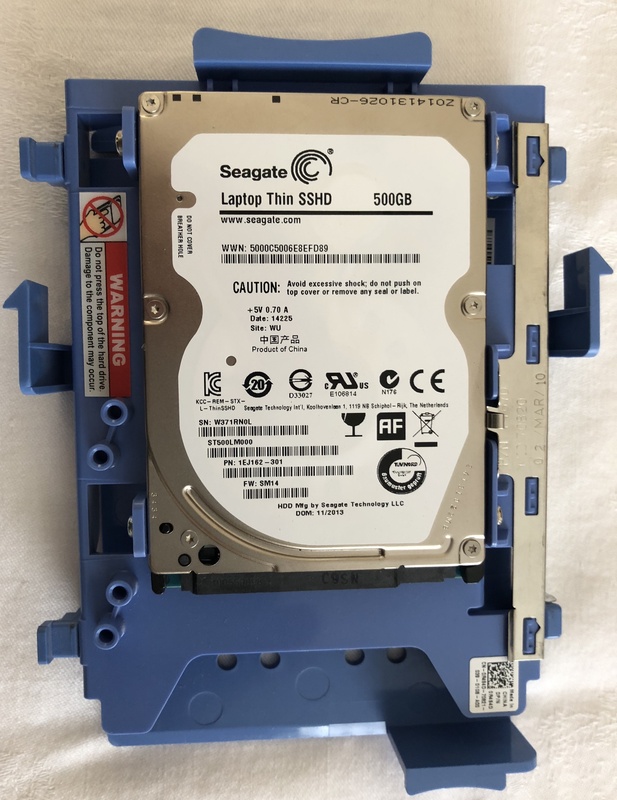 You do get a connector for a 3.5” floppy drive (retro) that is actually likely used for an optional media card reader, but adding extra SATA power would require creative splicing. 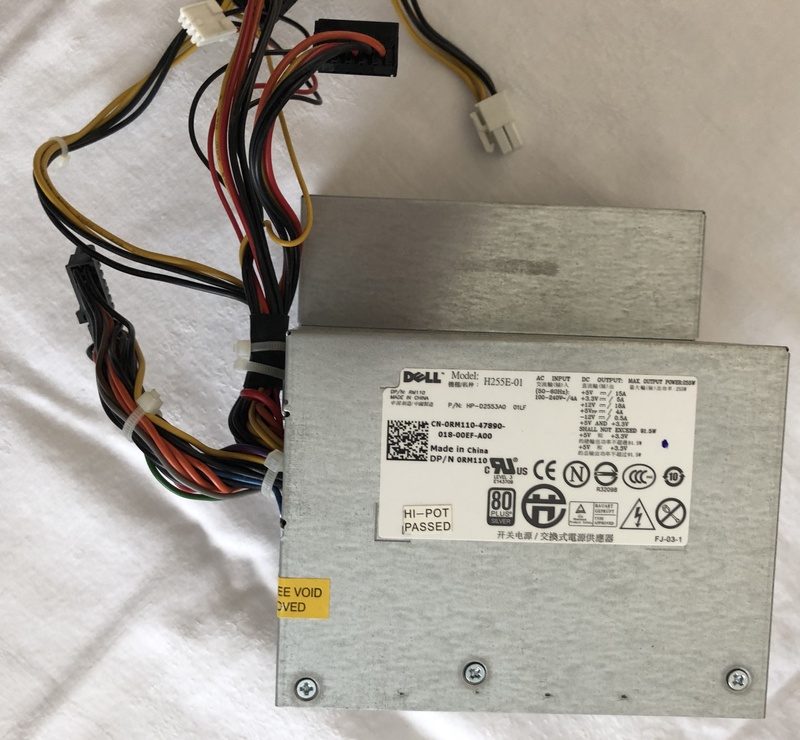 No doubt Dell manufactured a suitable power supply with the extra connector present but chose not to fit it to machines unless a second drive was ordered as an option. It is almost certainly available at a hefty price, at this point likely double what the computer is worth. Dell’s efforts to make this case toolless are entirely pointless. What is the point in removing the optical drive with a lever when a screwdriver must be employed to remove the screw mounts that secure it? 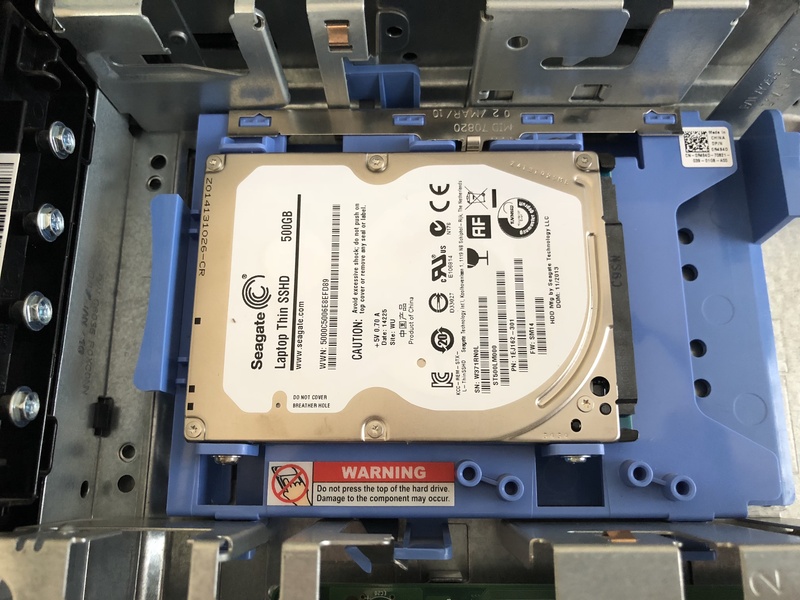 The same goes for the hard drive bay, which can be removed with no tools but actually swapping a drive requires the removal of four screws. The power supply retainer is a waste of metal, as it’s screwed in at the rear. The fan can’t be removed lest the board is removed too, which, surprise surprise, requires a screwdriver. Frankly, the implementation of a means to open the case is a complete waste of materials, as to do anything internally will require at least basic tools. This is a prime example of engineering for the sake of engineering, where the immense efforts that were clearly spent on this case are of no benefit what-so-ever to the user or the repair technician and only serve to increase the price of the product. If anything they detract from the product as carrying out even routine maintenance is far more difficult than it should be. 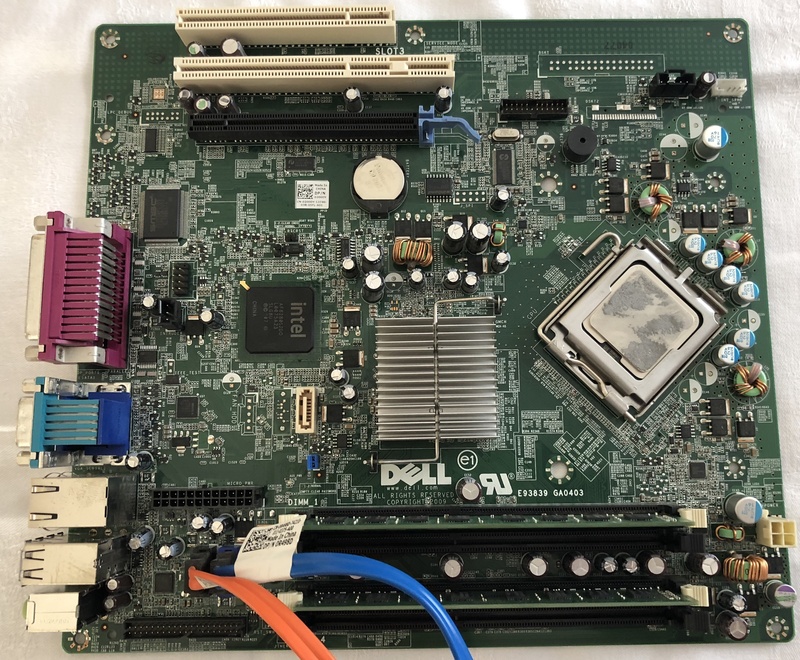 The mother board (referred to by Dell in the Technical Manual as the ‘System Board’) may look like a micro ATX board but it is in fact, a BTX design with proprietary headers and a backwards rear panel layout. If I recall correctly Dell did for a time switch to standard fit boards in their machines, including the aforementioned 4600. That board did have a proprietary fan header among other things, but it was at least a micro ATX form factor; as was the power supply, which made swapping both for standard parts a relatively simple process, complicated only by the need to re-align a few screws and fashion a mount for a standard rear fan. It’s a different story here. You could probably hack a standard board into the case fairly easily if you were determined, but the odds of the power supply being a standard ATX pinout are slim at best and you’d have to adapt the wiring for the front panel buttons, LEDs and connectors. The board does feature a standard Intel socket LGA 775 with four banks of 1066MHZ DDR3 non ECC memory modules, two provided in the default configuration. Intel 82567LM is provides gigabit ethernet, and also onboard are Analogue Devices ADI1984A audio, Intel Trusted Platform Module (TPM) 1.21, and PCI and PCIE X16 slots for low profile add-in cards. The ADI 1984A supports 24-bit, 192kHz high-resolution audio with >96dB signal to noise ratio quoted for both input and output. Headphone output impedance is particularly low at just 0.5Ω, which is a major plus and explains the 780s headphone performance which happens to be rather good. Dell’s cooling systems have always been a bone of contention for me. Their fans are proprietary, usually impossible to repair and ludicrously expensive to replace. More often than not the cooling system consists of a number of plastic airflow guides with hidden clips clips that are not only difficult to locate but become brittle with age. This one is no exception. The heatsink sits below a plastic shroud which is screwed into the case through the board on one side, and hooked to an unnecessary bracket on the other allowing it to lift, tilt and slide out of the machine. The cooling fan can then be removed, which in this case involves also removing the motherboard as the fan must swing forwards into the case and cannot clear the edge of the board. Front fan cleaning or replacement therefore requires complete disassembly of the machine. Dell’s cooling systems do work well, and by design are tightly clamped to the CPU for better thermal efficiency. I fail to see why 4 screws and a retaining bracket can’t suffice, as used often in the days of the early socket 478 Intel Pentium IV. In those designs the heatsink was bolted through the motherboard to four standoffs on the tray beneath, and the air shroud was a component of the fan assembly. It still had more annoying clips than a stock Intel design but it was a major improvement over Dell’s designs of late. 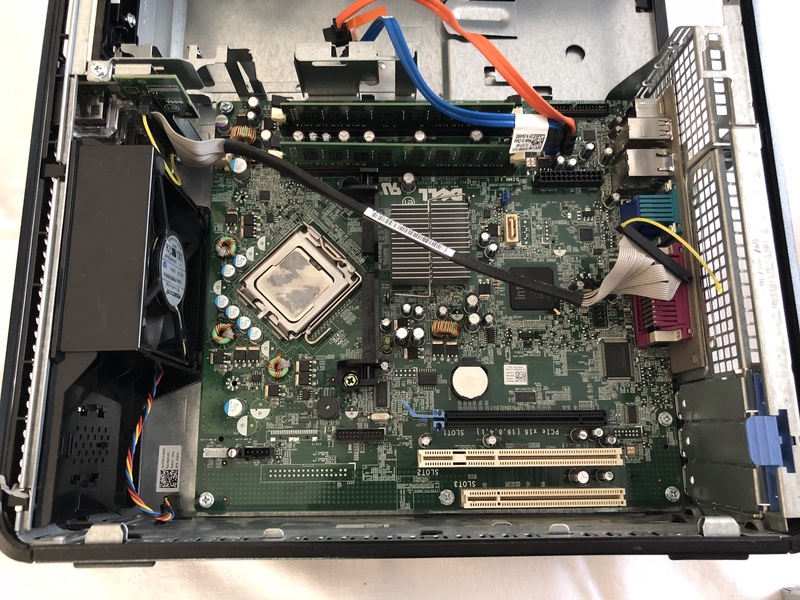 Dell’s cooling systems are a prime example of unnecessary and usually inferior proprietary redesigns of components that were better to begin with. I’m also not a fan (if you’ll excuse the pun) of Dell’s proprietary cooling fans, which in a best case scenario use a proprietary fan header with a non standard pinout. It is possible to fit an aftermarket fan to most Dell systems with a little modification, but why? Surely the number of replacement fans they sell doesn’t add up to the R&D and manufacturing cost involved in changing the header. 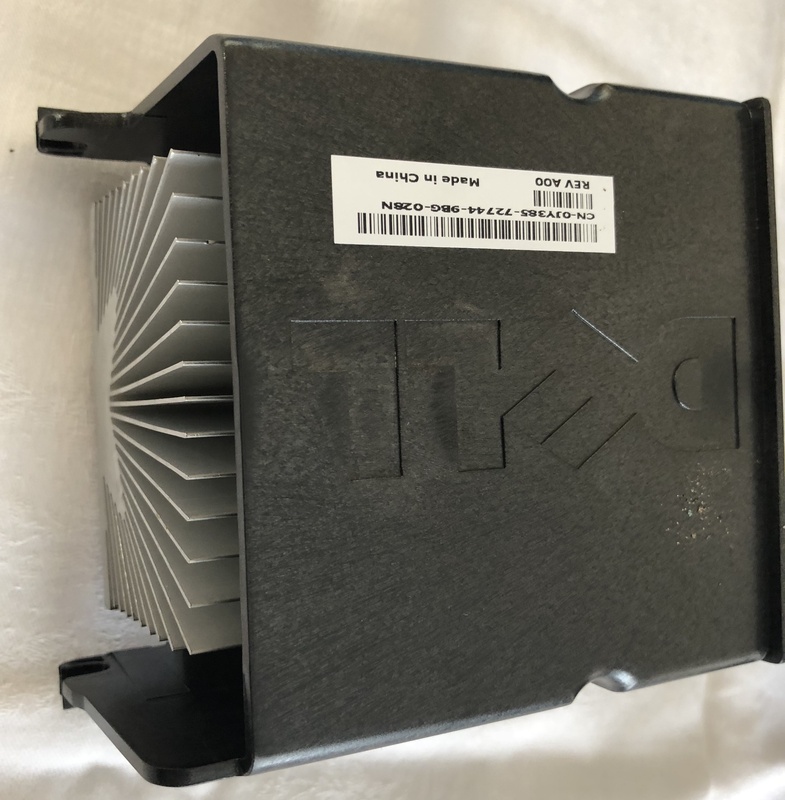 There isn’t anything particularly special about Dell’s fans as far as I can see though some of them reportedly employ sensors to vary the speed, and some are significantly deeper than standard off-the-shelf fans. And while I appreciate that the average consumer or employee doesn’t care how easy the fan is to remove, the technician and their paying customer certainly do. Swapping a fan in an ordinary machine is a 5 minute job, if that. Swapping the fan here is a 30 minute job, necessitating complete disassembly of the machine including cleaning and repasting the CPU if the job is to be done properly. With the machine cleaned and assembled I proceeded to install Windows 10, even activating with the attached Windows 7 Pro product key. I do applaud Microsoft’s initiative in allowing owners of Windows 7 and 8 a free Windows 10 upgrade, as despite still packing some of the bloatware from Windows 8 it is a vastly superior OS and shines on older hardware. 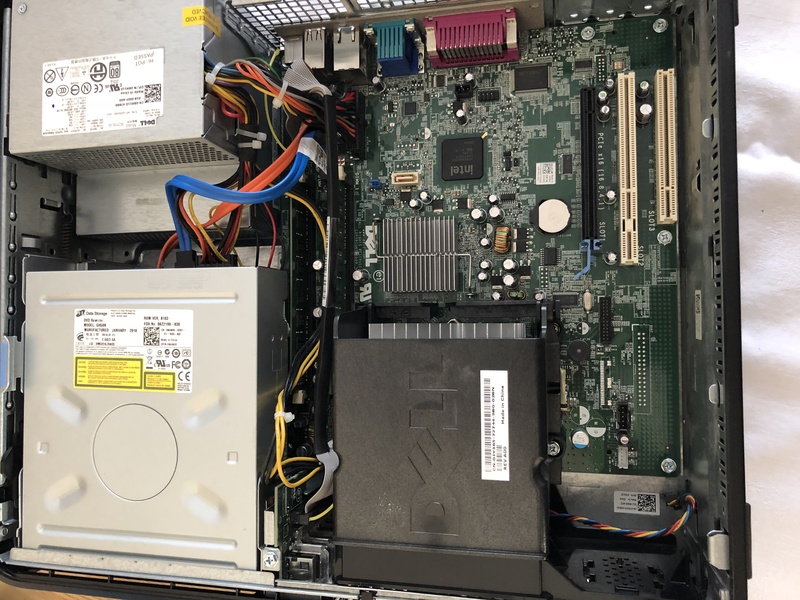 With a hybrid drive and an E7500 clocked at 2.93 gHz the Optiplex 780 manages a respectable sub-30 second boot time, and is speedy and responsive in use. Windows installation was made all the more difficult by the machine’s stout refusal to boot from its DVD drive when an operating system was present on the hard drive. Correctly setting the boot priority in the BIOS, and multiple attempts to use the boot menu which did recognise the loaded disc were to no avail. frustrated, I resorted to disassembly (again), connected the hard drive to my Mac and erased its contents, thereby forcing the machine to boot from the DVD as it was the only boot device. It reminded me of a time many years ago when restoring an Optiplex GX1 from the late 90s. Those machines appeared to have a temperamental ATA controller and could recognise a hard drive or optical drive but never both, despite being correctly configured and regardless of the cable settings used. There really was no cure for that issue other than to set boot priority each time the machine was booted (which was always forgotten even with a good battery), and keep resetting the system until it eventually decided to cooperate. Alternatively you’d load your Windows 98 setup files onto the drive via an external adapter, start up from a boot floppy and run setup from there. It also incorporated primitive chassis intrusion detection via a momentary contact switch which would often trip if weight was placed on top of the case and was swiftly bypassed. It was otherwise a very nice machine with particularly good audio hardware and a rugged build that was astoundingly heavy. A particularly annoying case design in typical Dell fashion, though thankfully lacking most of the unnecessary toolless aspects of their later cases. With Windows installed and updated I noticed a lack of available physical memory, owing to a finicky memory socket on one channel. Reseating both sticks was a success, though the sockets themselves don’t appear to be of the best quality and thus aren’t the most reliable, which was most likely the cause of my initial issue with the machine. The stock ram also had a substance on its contacts, likely a dielectric grease. I’ve seen this issue on Macs in the past where that substance has lost conductivity and resulted in memory errors. Cleaning the memory and sockets restored reliable operation. The optiplex 780 is surprisingly speedy and makes a decent machine for browsing and entertainment and even handles basic audio editing and some light gaming, not to mention server and development use. They’re available and plentiful on the used market for next to nothing and providing you don’t try to make any extravagant modifications they can make for a fairly decent PC. Repairs, modifications and maintenance is harder than it should be, with a ridiculous case design more of a hindrance than a help and a few unnecessary proprietary obstacles in the way. It was, barely, worth the minimal effort exerted in its restoration, but is ultimately a prime example of why off-the-shelf machines are best avoided in favour of assembling a PC yourself from standard components.